First, reset the circuit by pressing S3 so that the display shows â€˜0000.â€™ Now open switch S2 for the stop watch to start counting the time. If you want to stop the clock, close S2. Rotary switch S1 is used to select the different time periods at the output of the astable multivibrator (IC1). which simulator i should use for mm74c926? MM74C926 is not a clock-counter but a 4 decade ‘normal’ counter (from 0000 to 9999). If you want to count minutes and hours you have to use two ‘divide by 60’ counters. yeah. thesame as mine I dont know what to do to reset at 60 seconds. do you know the solution? can i know which ic can be used to replace 74C926? Also can i know how resistors are connected to the 7 segment display? i am also engineer of ETC….its great informative site…..good job.. If any use of RTOS system in electronics industry. Please tell me. After making the circuit we encounter some problems, instead of just counting from 0-59 it continuous up to 99. Any idea how to fix this. you know what, I’ve done with this by using 74C926. But, it’s just counting. When it’s 00.59, it just continue counting til 99. it should be 01.00 if it’s a stopwatch as you wrote at the title. sorry my friend i could not find the solution. what can i use as a replacement for MM74C926?? It is a special purpose custom made IC has no replacement equivalent. Wat will be the cost of tis project..! Bro does this project really work? What will be the price of overall project. How are the resistors connected to the 7-segments ? 7-segment display as 7 terminal, no 15 port of the IC is connected to the “a” terminal of the 7-segment display through resistor. Like that all the terminals of the IC is connected to the respective terminals of the 7-segment display. TO know more about the terminals of the 7-segment display check this link http://en.wikipedia.org/wiki/Seven-segment_display. Using raspberry pi GPIO pins to turn on a LED by giving high signal,and a switch as an input to turn it off.ith each time led ON it should increment the counter of 7 segment display , now the problem i m facing is that if i blink the led with a program it should reset the counter of 7 segment display using the same data lines . for doing this i have to make an additional circuit. kindly give some hints to proceed. what is the alternative ic for 74C926? lim did u get the alternative?? i’m done doing this stopwatch..but can’t operatingw well…the problem is cannot start….when reset,the LED show a number 8888…so what is the problem? how to make large size stopwatch? sir is there any replacement for ic mm74c926? hi can i use any other ic’s instead of mm74c926.if there any plz reply me……. i’m makein this ckt on EAGLE. but m not understanding which switches to use. plz can you help me? ur help are highly appreciated . HITEC UNIVERSITY STUDENT:I have Made digital stopwatch using this cct . and it is working properly.the problem is that IC2 is expensive (Rs 800) and its not available easily in market.you can use any seven segment display but it should be common cathode. its above 3rd pin should be ground.2 pole 4 position rotary switch should be used pole is connected with 22k resistor and other any two terminals with position 1 and 2.disp1 in this cct of milli sec disp2 is sec disp3 is minute.ground should be given properly use small wires as you can for breadboard. AOA. i am using proteus to design the stopwatch. Can u tell me which tansistor to use? The bc547 bipolar or the NPN. Also from where did u buy the IC? I am assuming you are living in the Isl/Pindi region. Also how do I connect the 7 segment displays with each other? pls tell me the applications of the chip used.how we can expand this project? plaese send me the required functions of the chip IC1 LM555,and IC2 MM 74C926.PLEASE INCLUDE WHY THE CAPACITANCE ARE IMPORTANT IN THIS CIRCUIT. i have made this circuit but its not counting..its showing 0000 reading but not counting..
Plz snd the questions and answers of project on internal measurement using 74c926(digital stop watch)which will be asked for oral examination as early as possible. i m not finding hw to cofigurate resistor with sevensegment…plz help me..
okey..thank you very for responding..!!.. Hi Asichi MM74C926 is an LSI with lots of digital circuits integrated into it. with discrete 741s you cannot build up the required circuit. instead of using 74c926… can i use 74ls series of ic.?? if yes,.what type of 74ls can i use.? It is humbly requested that please show your any contact or email espacially email of gmail account becasue my email id is also in gmail so we can contact easily. i want pcb design of digital stopwatch.please send me. I cant find mm74c926 in multisim too. what can i use instead of it ?? sir, plz send me more details of itz component and a fine circuit plzz i will be vry thankful to u sir…. i have to make it on multisim but i cant find mm74c926 in multi. what can i use instead of it ?? I am also trying to do so.. have you done?? oh man… this circuit saved me from my subject,it really worked, and it impressed my instructor..
it has two functions… the regular stopwatch and the split type. though the ic 74c926 type is expensive. i have pics on my facebook account of this project. RESET PROBLEM: why won’t it reset when the timer is on stop mode? I want to khnow scope of digital stopwatch. 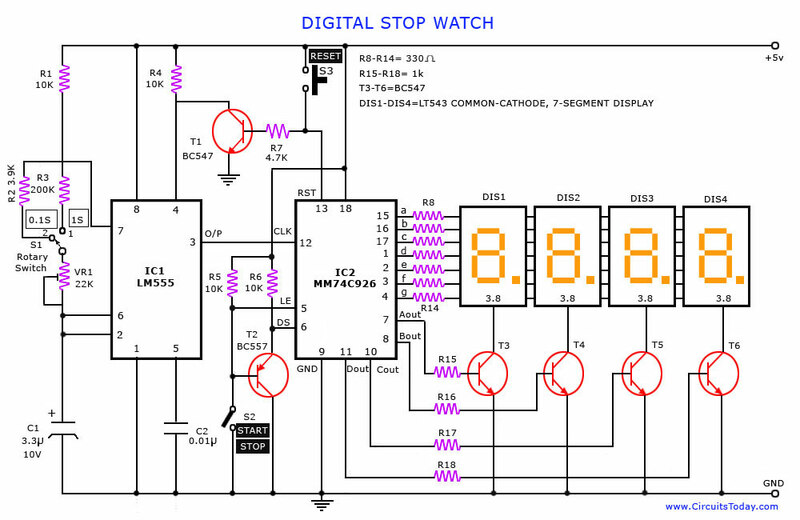 how can digital stop watch works it is a MM74C926 decade coUnter IC how it could count i me to say a digital stop watch will count 60sec and then reset. since a 74C926 counter is not there when simulating the circuit for the stopwatch, can a up/ down counter be used instead of this one? or which counter can be used?